Stowhealth is an active member of the Primary Care Research Network www.pcrn-eoe.org. Stowhealth practice is actively involved in clinical research and always recruiting patients to participate. Research is important because it helps to improve your healthcare by finding out which treatments work best, and by discovering new ways of treating illness. Over 500,000 people took part in research in England last year. The Primary Care Research Network East of England (PCRN EoE) is one of eight national research networks working together with the Comprehensive Local Research Networks (CLRN) to provide a wide range of support to the local research community. 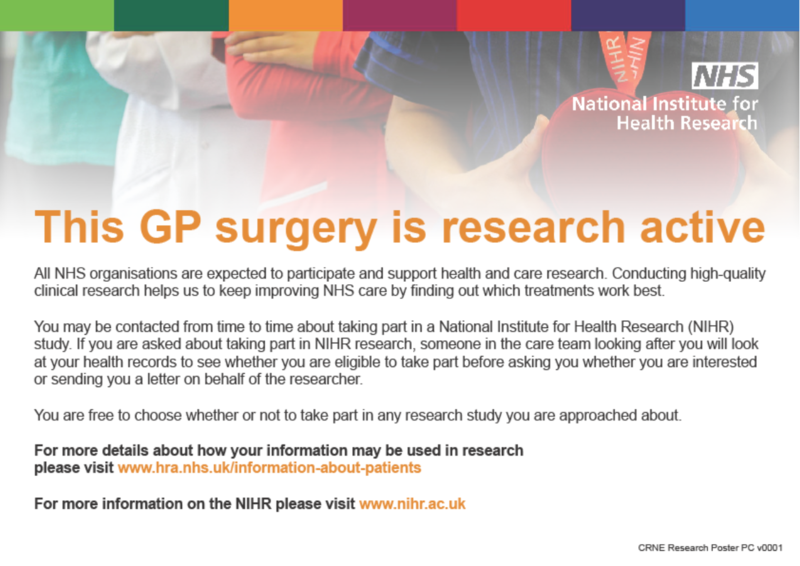 Our Practice participates in research activity and works closely with the Primary Care Research Network East of England , allowing more opportunities for more patients to be involved in research should they wish. By building on and extending existing academic and service partnerships, research collaboration across the East of England is further strengthened. The PCRN EoE also helps our practice by supporting us to recruit and take part in clinical studies through their locally based research nurses and network coordinators.